So here we have listed out the various Foramens seen in the skull and the structures passing through them separately. 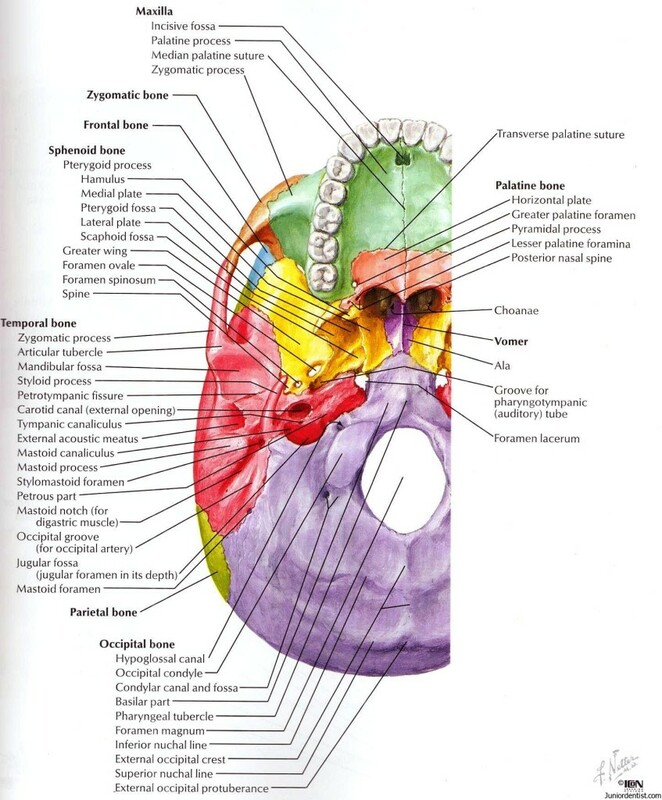 There are many Foramen small and big which have structures passing through them and we have listed most of the major and important Foramen in the base of skull and the structures passing through them. Foramen Magnum: The term literally translates to “great hole” in latin which is a large oval foramen at the base of the scull in the occipital bone. The Foramen Magnum is seen in many other animals as well which is the path way for the Spinal cord. It is surrounded by four bones – para squama, left and right pars lateralis and pars basilaris. Mandibular Foramen: This is one of the smallest foramen located in the Mandible precisely on the internal surface of the Ramus. The shape of the foramen can be of two types – Horizontal Oval share or V Shape having a groove to seperate the anterior and posterior parts. Mental Foramen: It is located on outer or lateral surface of the Mandible, usually in between the roots of the premolars. The opening of the metal foramen is positioned posteriosuperiorly. The location of the mental nerve height varies from age of the patient and also with the resorption of the mandible. Parietal Foramen: These are also called as Parietal Foramina and are called so as they are located on the back of the parietal bone close to the upper or sagittal border of the bone. The size varies and in some people it might be absent. The structure passing through it drains into the superior sagittal sinus through this foramen. Mastoid Foramen: A hole located in the Temporal bone towards the posterior border of the mastoid process. The size differs from person to person. Foramen Cecum: It is defined as a shallow depression in the posterior dorsal midline of the tongue whic is the remnant of the cranial part of the embryonic duct from which the thyroid gland was developed. Greater Palatine Foramen: The name is given due its location along the greater palatine sulcus of palatine bone inside the posterior hard palate of the greater palatine canal. lacrimal, frontal and nasociliary branches of ophthalmic (V1). What are the important of long lived contraction and relaxation of the smooth muscle?